The Sixth Tokyo International Conference on African Development (TICAD VI) will be held from 27 to 28 August 2016 in Nairobi, Kenya. We asked Junzo Fujita, Ambassador for TICAD, about the history of TICAD and the nature of Japan-Africa relations today. Centered on the Kobe Institute of Computing, Graduate School of Information Technology (KIC), the City of Kobe and the Rwandan capital of Kigali have forged a dynamic and mutually beneficial partnership. 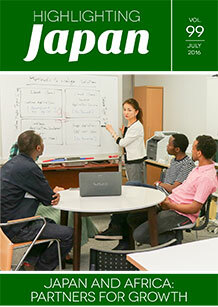 Japan’s popular volunteer program Japan Overseas Cooperation Volunteers (JOCV) was established in 1965 as a means for young Japanese citizens to support the development of partner countries. Of the 40,000 young people dispatched under the program to date, some 13,000 have worked in Africa, in fields including health care, agriculture and education. More than thirty years after its construction, the Matadi Bridge across the Congo River continues to benefit from Japanese technological support. The Japanese business philosophy of “kaizen” is gradually and systematically taking hold in Africa, with Ethiopia leading the way. A Japanese manufacturer of sanitary ware is introducing its "Green" toilet technology to non-urban parts of Kenya. Yuko Morishige is empowering women in Burkina Faso through her efforts to bring locally produced soap and cosmetics made from shea butter into Japan. A portable test kit developed by researchers in Japan can identify infection with ebolaviruses in as little as ten minutes. Cameroon-born Vincent Wouassi Jr. is the driving force behind the distinctive sound of the Tokyo-based Wouassi and Roots Band. Artist Kensuke Miyazaki is best known for the murals he paints with children in developing countries around the world, a collaborative effort that began and continues at Magoso Primary School in Nairobi, Kenya. Five hundred years after they were first produced, Takayama chasen remain the tea master’s whisk of choice. Cultural properties on a number of islands in Nagasaki Prefecture speak of the exchanges which took place between Japan and the Asian continent many moons ago.